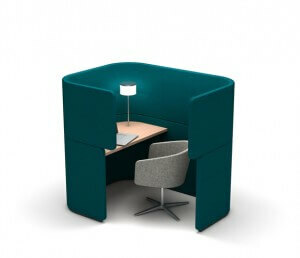 Home/desk-mounted panels/Is This the Shape of the New Cubicle? Despite rumors that the cubicle is going out of fashion, there are still folks out there looking for ways to give this much maligned workstation a makeover. PearsonLloyd, a British design firm, has determined that what employees want isn’t a more open office with less privacy, but secluded areas they can call their own. Thus was born the “Me Place”. These cubicles offer a curved, wraparound wall that encloses the user on up to 3 and a half sides (leaving just a small open doorway for entry and exit). The single, curved panel is nice and high to keep coworkers’ prying eyes from peeping in over the wall. The whole thing is fabric covered to offer sound control. These cubicles aren’t expansive (cozy is probably the term the designer would use) and they offer just a worksurface, a shelf, a task light and a hanger. This means they have somewhat less functionality than today’s high-end cubicles that feature storage space, tool rails, cable raceways, and much more. What sets the Me Place apart is that each cubicle is…set apart. They don’t share walls with each other. Instead, each unit is separate from the others. This means they can be rearranged across a floor plan very easily. However, making every single cubicle separate with walkways between also means they don’t make the most efficient use of space. That’s one reason we don’t predict the Me Place will catch on in most work environments. Space simply costs too much to make this design attractive to employers. Fortunately, there is some middle ground between these isolated cubes and a totally open office with benching workstations and no privacy. Our new desk mounted privacy panels provide both visual seclusion and noise control. They can be fitted to your existing desks or worktables for a cost-effective makeover that takes only a few minutes.